The initial part of the under painting is completed (the brim of the hat is still wet so bit of a glare) and now the skin layers will be built up. 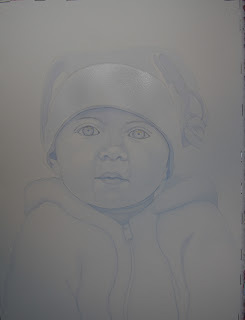 I have erased some of the pencil lines and will continue to do so as the portrait progresses. The ugly globs of yellow on her eyes is the masking fluid which will have to remain there for a bit as she has very dark blue-grey eyes so I want to keep the reflections crisp until nearer the end. Her hat will need to be left until the very end now as red is very unforgiving so if it gets wet after it has been laid down, look out! The sweater is starting to take shape and is white in the reference photo so I am using a blue under painting and may grey it up a bit in areas for variety.